The Republic of Vietnam Campaign Medal is a gold six-pointed star with rays, 32 cm in diameter which is superimposed with a white enameled star, 42 cm in diameter. Centered on the stars is a Green disc, 18 cm in diameter. On the disc sc, 18 cm in diameter. On the disc is an outline of Vietnam and a red flame made up of three rays situated between North and South Vietnam. The reverse side of the medal has a circle with a band with the word "CHIEN-DICH" (Campaign) at the top and "BOI-TINH" (Medal) at the bottom. In the middle of the circle is the word "VIET-NAM". The Republic of Vietnam Campaign Medal’s ribbon is 1 3/8 inches wide and has seven stripes. The first stripe is 1/16 inch of Gherkin Green followed by 3/16 inch of White, 5/16 inch of Gherkin Green and a middle stripe of 1/4 inch of White. The following stripes are 5/16 inch of Gherkin Green, 3/16 inch of White and 1/16 inch of Gherkin Green. Served in the Republic of Vietnam for six months during the period of 1 March 1961 and 28 March 1973. Such individuals must meet the criteria established for the Armed Forces Expeditionary Medal (for Vietnam) or the Vietnam Service Medal, to qualify for the Republic of Vietnam Campaign Medal. Six months service is not required for those who were wounded by enemy forces; killed in action or otherwise in the line of duty, or captured by enemy forces. The Secretary of Defense approved a request for approval of foreign awards to US Military personnel on 7 February 1966. 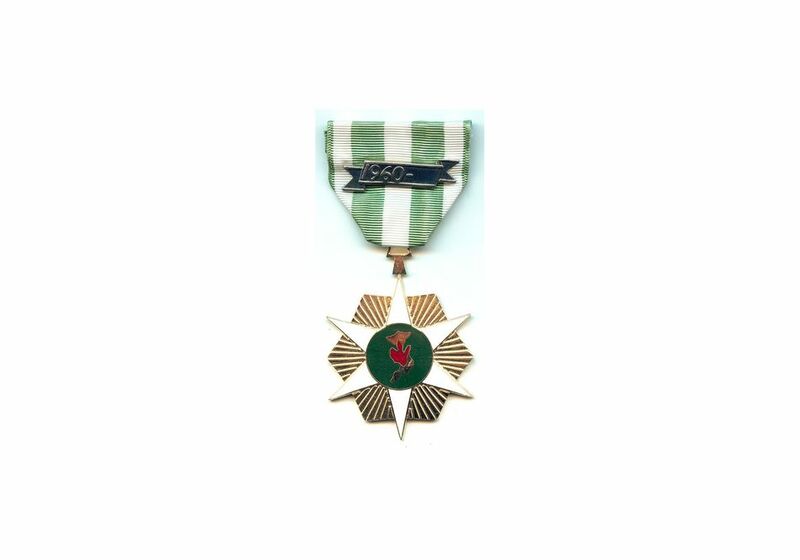 As a result of this approval, the Republic of Vietnam Campaign Medal with device bar (1960- ) was awarded to US Armed Forces personnel by the Government of the Republic of Vietnam per Republic of Vietnam Armed Forces Order No. 48, dated 24 March 1966. The acceptance, criteria, and description were announced in the Federal Register, Volume 31, No. 147, 30 July 1966 (Title 32, Code of Federal Regulation 47). The Republic of Vietnam Armed Forces Memorandum 2655 determined that there were two devices to be worn on the ribbon. The first device was for the time span of 8 March 1949 - 20 July 1954 and is not authorized for wear by American Military Personnel. The second time span was from 1 January 1960 with the last period to be decided after the war was over. The ending period remains blank since the Republic of Vietnam Government ceased to exist before the ending period was determined. The devices for the medal are in two sizes with the larger size being 1 13/64 inches in width and worn on the suspension ribbon of the full-size decoration. The normal size is 19/32 inch wide and is worn on the miniature decoration and service ribbon bar. The Republic of Vietnam Campaign Medal is a foreign award and is not issued by the United States Government. It is available through commercial avenues.